If you’re like many of us in our 20s, 30s and 40s, you haven’t taken the decision to start a family lightly. Choosing whether or not you want to have children (and then, you know, actually making it happen) is one of the biggest, life-altering choices you’ll ever make. I don’t necessarily want to compare it to starting a business, but based on my experience so far at almost 30 weeks into my pregnancy, the emotional roller coaster has been quite similar. There’s joy, stress, excitement, utter exhaustion, hundreds of books to read on how not to screw your new role up, a bazillion questions and considerations to make, and oh – the occasional feeling of needing to vomit. So yeah, similar to entrepreneurship in my book. As a parent-to-be or perspective parents-to-be, there’s going to be a lot to undertake and consider. Below are the top considerations this CFP® recommends you make to ensure you’re prepared. Do you have a quarter of a million dollars laying around? No? Well, according to this article, it will cost the average middle-income couple $241,080 to raise a child that was born in 2012 (not including extras like cub scouts, soccer, private schools, dance lessons and the newest line up of Disney movies, shows and books that your kid will be singing along with for months to come on repeat). Let’s not forget that this is a per child number. Meaning if you’re looking to build a big family (bless your soul), you’re looking at upwards of $1 million just to get your kids out okay on the other end. Now of course this isn’t a bill that’s going to hit you at once, and I’m sure that plenty of Americans are raising their kids on less, but what this statistic does highlight is the fact that there is a need for some serious planning and organization. So what can you do to alleviate some of the money stress that comes with prepping for a baby? Rework that budget! Emergency Funding: Build up your emergency savings to include 3-6 months of living expenses. Err on the side of caution if only one of you will be working and build up 6 months of reserves. Remember, this is money that you want to be accessible should you need it, so don’t go throwing it into the stock market or tying it up somewhere. Groceries: Factor in new expenses like diapers (and more diapers), wipes, formula and baby food into the budget. Start pricing these items out and determine if you need to make adjustments in other areas of the budget to compensate. Transportation: What does your current car situation look like? Do you have safe and adequate room for a car seat? Will you need to put aside money for a second or replacement vehicle? If so, now is the time to set a plan in place to work towards this goal. Medical Costs: Always read the fine print on your insurance policy and call your benefits department with concerns or questions. Look into what will and won’t be covered throughout the pregnancy and also understand what your premiums and co-pays may increase by once your baby is here. Check with your HR department to determine if your employer has any tax-advantaged plans in place to assist you. Also, you typically have up until 30-days after the baby is born to add him / her to your insurance. Do NOT miss this window. Childcare: This report by the U.S. Census Bureau shows that childcare costs have risen tremendously since the days when our parents were confronting the expense. Explore the costs of childcare in your city, whether it’s daycare groups, individual care or hiring a nanny. Are you or your spouse planning on making the switch to a stay-at-home parent? Be sure to sketch out what your new financial picture will look like with one income instead of two. (If you need help working through this, let’s chat). College Funding: Are you hoping to assist your children with college? Consider the ever-increasing costs and set a plan to start saving as early as possible. Keep in mind though, as much as you don’t want to, your retirement needs to come first. Your kids can take out loans and get scholarships for college. However, nobody is going to give you a loan for your retirement. The thought of not being around for your family and children is one of the most unpleasant around. However, when it comes to planning for the “just in case” scenarios, remember this is about them and not about you. In order to make any situation where your family needs to make decisions for you less stressful, it’s in your (and their) best interest to document your wishes and ensure you and they are protected against the unknown. Wills: Whether you do or don’t have a will in place, now is the time to either implement one or review it. Having a will not only ensures that your assets are distributed in line with your wishes, but it allows you to assign an executor to handle any matters associated with your estate and select a guardian for your children. Guardianship: When choosing a guardian for your children, ask yourself who your children would feel most comfortable with and whom you feel would most responsibly and effectively control any funds left to them. Consider the values, beliefs, and overall emotional comfort your chosen guardian could provide to your children. Remember to have a discussion with those you choose and to nominate a contingent should your primary be unwilling or unable to serve. Trust: A trust document can provide instructions on how you would like any funds left to your children to be managed and spent. In addition, you can appoint a trustee (also a primary and contingent) to manage the funds. Having the right kind of protection in place is just as important as having a detailed spending and estate plan. Evaluate your existing life, health and disability coverage and ensure that you have the appropriate amount of insurance in place should something happen to you or your spouse. Life Insurance: Life insurance is important because it ensures that if your family is faced with the premature death of you or your spouse, the coverage provided by the policy can be used to replace any income lost so they are able to cover their living expenses and sustain their lifestyle. When applying for coverage, term policies will be the most affordable. Be sure to consider items like your current income level, outstanding debts that would need to be paid off, existing savings and assets and even the role you play around the house in terms of yard work or just keeping the place picked up. Disability Insurance: Even though your ability to earn an income is one of your greatest assets, disability insurance still tends to often overlooked (although it’s incredibly important!)! A disability income insurance policy ensures that should you become disabled for a short or extended period of time, you are paid a percentage of your current income on an ongoing basis. These types of policies safeguard you and your family against a complete loss in income. So there you have it from a CFP® and mom-to-be’s perspective. When I started writing this post, I put a call out on Facebook for input from current parents on, if they could give one money tip to a mom-to-be — whether it’s how and where to save money, websites to shop, organizers to use, systems to put in place, etc. — what would it be? Below is a sample of the responses. 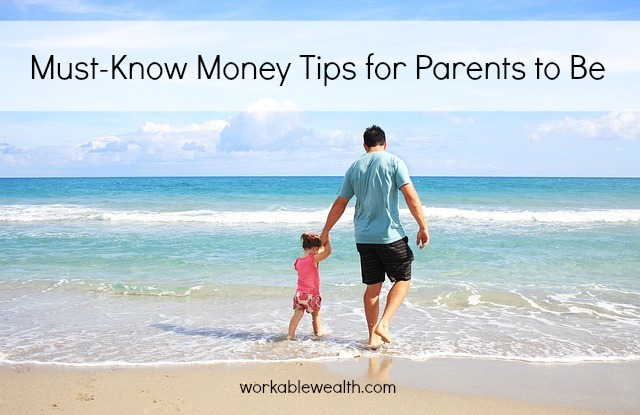 To download the complete list of Money Advice for New Parents from Parents, go here. And if you’re at the point where you’re staring down a growing family, but aren’t sure where to start with getting your finances organized, take advantage of a free 30-minute focus session to gain some insight. 1. Outsource. Delegate. Automate. Set up systems and outsource or delegate as much as possible before the baby gets here! Not just business tasks, but as many personal ones that you can get automated and delegated too. 2. Network with other moms/families to trade clothes and items (playpens, swings, etc…). When kids are newborn they rarely get to wear their stuff long because they grow so rapidly. Other folks may have baby clothes (and older) they would be happy to part with. We’ve been fortunate to have friends that have been able to hand down clothes for our kids that has saved us a TON and many of the clothes were hardly worn (we’ve even gotten stuff that still had price tags on them). Of course we’ve passed on a ton of clothes and items as well. 3. Don’t be afraid to ask for help! … And create a budget for wine. 4. Never go to the grocery store without a list. You’ll buy nothing you need and everything you want. When I go without a list it takes me twice as long and I never get anything we actually need. 5. Never go to Target alone. You will spend way too much! Only go when your kids are with you and you can’t leave fast enough. (I did NOT find myself alone in Target last night and drop a hundo or two in like 5 minutes – that was totally someone else). This tip is from Kelly Parker Smith. 6. Don’t buy every big ticket item you think you need prior to your baby coming. Borrow items from friends like baby carriers to see if they work for you and your baby. Some babies like to be swaddled, others their legs hanging. And each child you have can and will be different. Some baby carriers don’t have enough back support; others do. You’ll find these nuances with almost every product/child. Borrow first, then buy. This tip comes from Rachel Olsen. 7. Find a way to put your investing on autopilot, either with the use of an advisor or a well-developed plan. Unless you are a super-mom, there will be weeks, months, years, when you’ll be too busy to scrutinize every investing move so the more that is automatic, the better. Max out retirement (when possible!) and put money aside for college savings…the more in designated tax-advantaged accounts, the better. This tip comes from Julie Starnes Rains. 8. Practice your baby budget while you’re still pregnant. Have a month or two where you add in the cost of diapers, wipes, formula and/or breastfeeding supplies, daycare if you’re using it, pediatrician copays, and any other expense you think your kid will need. Working it out ahead of time makes it so much easier when you actually need to do it. 9. Use Amazon Subscribe & Save. If you get 5 or more things a month you save 15% off Amazon’s already reduced prices. We do this for diapers, wipes, diaper pail trash bag refills, and more. It’s also nice that I don’t have to haul these things from the grocery store every month! 10. Make the most of your spending. Do your online shopping through the ebates.com portal. Ebates pays you cash-back when you enter certain online stores through their website. Some of the online stores moms might be interested in include target.com, drugstore.com,diapers.com, and – my personal favorite – vitacost.com. By shopping on sites like those through the ebates website, I’ve earned over $400 cash-back! Tip from Brianne Grogan. 11. Buy diapers at Target. There’s almost always a buy 2 get a $15 gift card. The stock-up method works for us and it helps to not be stuck last minute with a diaper run to make. 12. Don’t be loyal to brands! My first baby had the best of everything including the expensive formulas. My 2nd child received Walmart brand formula for half the price and it was just as good as the expensive brand. This tip comes from Michelle Remeta. 13. Buy Costco wipes. You will not be disappointed — nor will you have any fingers break through the wipe. Want to download the full list of financial tips for new and expecting parents? Click here! And if you need someone to walk you through the right money moves to make, don’t forget that you can grab a free 30 minute session with me.